In 1877, the U.S. Government opened the Nez Perce lands in Oregon to settlers and ordered the tribe to move to a reservation in Idaho Territory. Although reluctant to leave their homeland, the Nez Perce began the long trek eastward. A small band of young warriors vented their frustration, however, in two days of deadly attacks on settlements along the Salmon River. Realizing that the U.S. response would be overwhelming--particularly in light of Custer's defeat the year before--the Nez Perce leaders, including Chiefs Joseph, Looking Glass, and White Bird, prepared their people for war. A U.S. Army battalion led by Civil War general Oliver O. Howard along with several other coordinated army units began pursuit in an effort to subdue the Nez Perce and forceably move them to the reservation. The Nez Perce resolved to escape to freedom in Canada. Using their intimate knowledge of the land and their native Appaloosa horses skillfully, the Nez Perce were able to successfully check and elude the much larger American force for more than three months as they wound their way across the Rocky Mountains, through the newly established Yellowstone National Park, and into Montana. The war finally ended when the exhausted Indians--men, women, and children--were surrounded in the Bear Paw Mountains. Looking Glass was shot dead, and at this point, Chief Joseph relinquished and gave his famous address of surrender to General Howard. While most of the Nez Perce ended up on a reservation, the band led by White Bird was able to make their way to Canada and freedom. The Nez Perce War is one of the most important and emotional campaigns of the Indian Wars. It essentially closed an era in American history, and the amount of time, money, and troops required to subdue the Nez Perce brought the plight of American Indians and the reservation system to the front pages of newspapers around the world. 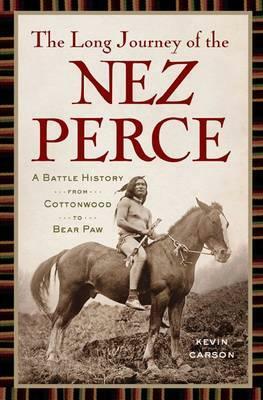 In "The Long Journey of the Nez Perce: A Battle History from Cottonwood to Bear Paw," former U.S. Army engineering officer Kevin Carson brings his intimate knowledge of the territory crossed by the Nez Perce along with his skill as a cartographer to reconstruct in detail the battles and skirmishes along the entire route of the conflict.